In India, we love the 'more for less' tag line. Larger servings, 'two for the price of one', 'festival discounts' and over the last few years, 'more seats in our cars' are all catch phrases currently trending. The MPV segment in India has been registering steady growth these last few years and new players are keen to enter this space. People carriers or MPVs are rightly popular with our large families and, with the Go+, Datsun is targeting new car owners with a few more mouths to feed. Actually not a lot - everything that's different lies past the rear door making it a true up sized Go. The roof, body and the floor aft of the rear door have been extended and two seats have been dropped on to the floor of the resulting larger boot. 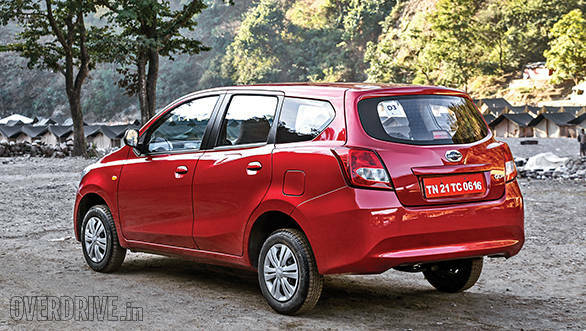 The design has even been cleverly executed to accommodate the same tail lamp units as on the Go. From the front of the car you just cannot tell the two cars apart. The bonnet, grille, headlamps, bumper, in fact everything is exactly the same as on the Go. It's only when you move to the side that you notice that the body is longer and there is one more pillar climbing up to the roof. From the rear too it's unmistakable that this is a larger car and it's grown in length by a generous 210mm to 3,995mm so it just sneaks under the 4 metre bracket for small cars but still sits on the same wheelbase. And without taking a peek into the rear window you'd never guess that this additional space holds an extra set of seats. Step inside and the cabin is the same -reasonably fresh dash layout, soft touch plastics, the quirky handbrake and front bench seats. 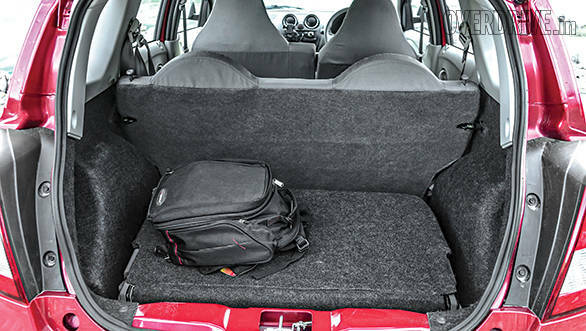 And it's the same story with the second row as well which is quite roomy for a hatchback. Features list for all variants haven't changed either and there's been no addition of ABS or the option for airbags. Datsun stress that they have focused on other safety areas like the responsive powerful brakes, high visibility cabin and well tuned suspension for better control of the vehicle. They are working on ABS and air bag systems for the Go and Go+ and are also working closely with the regulatory bodies and will add these features once the regulations change. The engine and mechanical bits too are all identical with peak power and torque figures exactly the same as the Go. What has changed though is the engine tuning and the way that torque and power are made. The ECU has been tweaked slightly to accommodate the extra 38kg that the car has gained and also the extra cabin volume that the air con unit has to cool. This will see a drop in efficiency though Datsun are claiming 20.62kmpl, which is a drop of just 0.01kmpl. Datsun engineers assured us that the Go+ was always on the drawing board and so all the car's components, like the engine, brakes and air conditioner were chosen to handle the needs of all Go variants. Here too there's little new to experience. The altered ECU tune hasn't changed the eager nature of the three cylinder mill. It's nice and responsive and through the hilly roads around Dehradun and Rishikesh, it was quite a bit of fun. 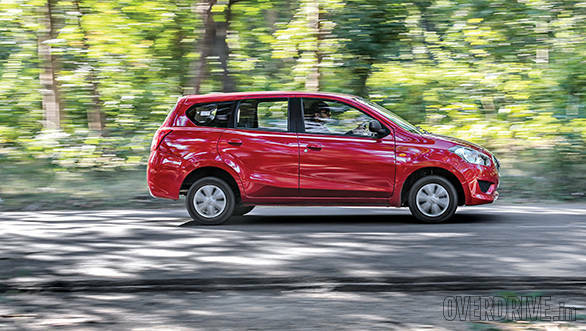 The light feeling steering and brake make it a very easy car to drive around town but the grip from the 155 section, 13-inch tyres is not the best and there isn't a lot of it around corners. The suspension has also been slightly tweaked for the larger rear overhang and increase in weight and it still rides fairly well over small and medium bumps. The one complaint is that the sound insulation from the underbody and inside the wheel arches is quite poor and every little pebble that impacts these areas is clearly heard inside the cabin. 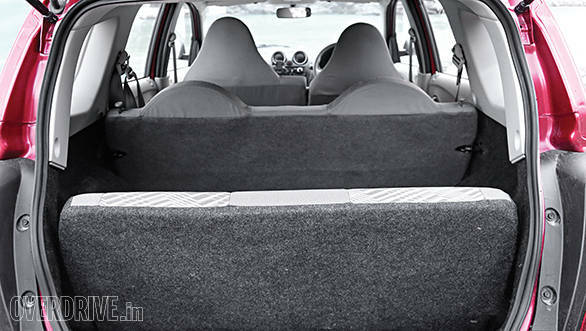 Better sound insulation could make a big difference in the driving experience. Now to the real question - it's bigger but how many people can you fit in the Go+? The truth is the Go+ is still strictly a five person car. The space in the third row is only suitable for small children (up to 10 years of age according to Datsun) and can in no way fit a full sized grown-up. 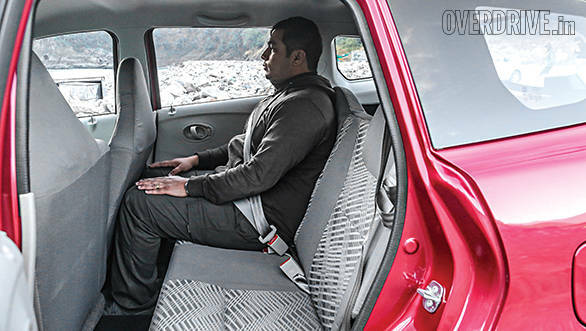 Datsun are being honest about this and are rightly positioning it as seating for small children or extra luggage space. As a place to sit, it's not quite the easiest to access. I tried it out just for the experience and I have to say it wasn't pleasant. I had to squeeze past the second row that 'tumble folds' forward, leaving a small gap to enter the space. Once inside and with the second row folded in place, I was curled into an untidy, uncomfortable ball. I'm plus-sized alright, but this makes the Mini rear seats, famous for not being the most comfortable, seem like a lounge. Only small kids will find this a comfortable space, and at the rate kids grow, they'll outgrow it fast too. It's when you start to look at it as a place to hold more luggage that the Go+ starts to make more sense. There's been a healthy 100 litre growth in boot space that now offers a generous 347 litres with the rear seats folded down. That's larger than any hatchback currently in the market. On our drive we managed to fit a large picnic basket, two foldable chairs, a tent and two days worth of luggage. So a weekend's worth of luggage should be no problem at all. It's also how the Go+ really works - as a small estate like car rather than a seven seater MPV. 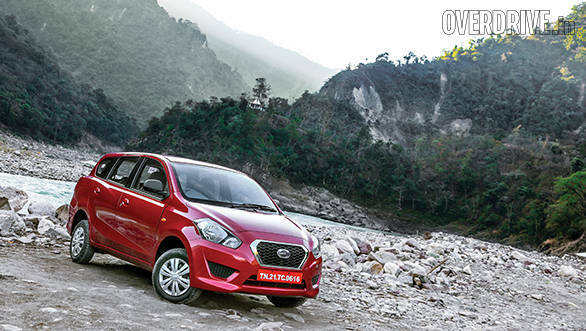 Datsun will be launching the Go+ in four variants and we expect them to price the base D version at Rs 4.0 lakh ex- showroom while the top of the line T variant should just breach or come close to the Rs 5 lakh mark. For that price, you can look at owning a fairly pocket friendly car for a large family with kids that at the pull of a couple of latches, can turn into a hatchback with the luggage capacity of a small sedan.